Another excellent turn out by both teams led to the Club`s Mens team and Ladies Masters teams consolidating their leading positions in this second sunny fixture at St David`s College. The women were again led home by Lydia (1st U20) , followed by Andrea and Megan (L35s), then Bronwen (U17). Good packing saw Ellie (2nd L50), Jenny Hemming (L40), Sarah (2nd L45), Hayley, Emma and Emily (040s), Alex, a struggling Maggie (2nd L60) and Ron (M70). The Ladies team was 2nd at this fixture and are in 2nd aggregate position, only 6 points behind Colwyn Bay! Ron Samuel had another commanding first place in the men`s race with Matt (3rd), Llyr (11th), Cai (34th), Adrian (M40) on his debut 39th and the evergreen Arwel (2nd M50) who missed the start 41st. Gary (M40) was 56th, Craig (M40) 58th , Phil Tan (3rd M60) 92nd, Trefor (M50), 93rd, Phil Targett (M45) 98th, John Mainwaring (M55) 114th, returning from injury Jeremy (M55) and 120th, Richard (M45) 123rd, Ed (M40) 125th and Emyr (1st M65) 133rd. The Mens team have a commanding 225 point lead over Meirionydd, while the Male Masters are in overall 2nd position. Newly re-re-re-recruited member (is it for the second or third time – we’ve lost count?! 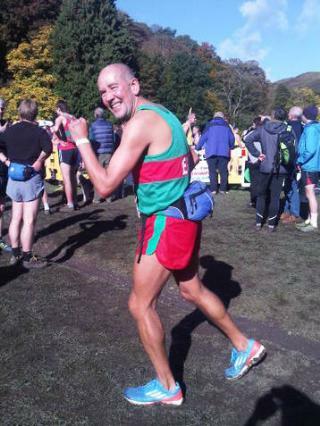 ), Emlyn look-at-those-gastrocs Roberts of Dwygyfylchi, models the new Eryri kit at the FRA Relays in Church Stretton last weekend. NB Trendy matching fell shoes sadly not available here! For those awaiting the newsletter. 2 quick updates. and Andrea Rowlands. Minor details. For those reading the 3 Peaks Yacht race reports about success and failure. The quickest running team and king of the mountains for 2011 contained Eryri’s Iain Ridgway, with Martin Beale, breaking the record on the Scafell running section, potentially setting a new Ben Nevis record time. Such runs are down to 70/75 mile weeks, week in week out. Not luck. Again minor news. Confirmation of the results from Treborth show the Womens and Mens team in first position and the Masters Women and Men in second position. Arwel and Emyr were 3rd in their categories, 050 and 065 respectively, while Lydia and Andrea were both 2nd in the U20 and 035 age groups respectively, and Annie and Ellie were 2nd and 3rd in the 050 age group. Well done to all! The next fixture is on Saturday 20th October at St. Davids College, Llandudno LL30 1RD. This course was run for the first time last year and was warmly approved. Let`s try to have a good turn out for this fairly local fixture and carry on the good work from Treborth! Despite picking the worst day of weather for a while, the inaugural Fabian4 Dyffryn Conwy Mountain Triathlon was a huge success last Sunday (30th). A total of 76 competitors entered the grueling race, split into 31 solo and 15 teams of three. The race consisted of a kayak leg on the Conwy River followed by a 13kms fell run and a 19 kms mountain bike. The solo entrants did all three disciplines, whilst the teams required one member, including a female, to do each leg. Eryri’s Ben Beachell finished 1st vet40, 5th individual in 3:49:44, Craig Jones finished 8th vet40 in 4:23:0 & Paul Jones 9th vet40 in 4:41:40, despite a swim and a walk in the middle of the kayak leg! Ashley Wager (runner) & Brian Robbins (biker) were joined by Pascale Eichenmuller to finish 3rd team, in a time of 3:47:48. Jenny Pinches (nee Williamson) finished the run in 1:34:10 to help her team finish in 4th position, with Louise Emery-Jones just 25 secs behind, helping her team to finish 7th, after their paddler had relinquished his attacking position to help Paul Jones get himself & his kayak to the bank! SPJ & Claire Dallimore were on the same team, Steve completing the run in 1:26:15, & Claire the bike leg in 1:07:46, making her the 3rd fastest female on that leg, having done a 60k endure race the day before! Judith Jones stepped in last minute, and did the run leg with her husband Steve hot on her shoulders, to help her team finish in 13th place, as did Adrian Williams, who was the stage winner on the run leg in a cracking time of 1:16:06. The bad weather, especially the high winds, led the organisers to switch the kayak leg from the 13kms ascent of the Conwy River, from Conwy Castle to Dolgarrog, to a shortened 8km leg out and back from Dolgarrog Bridge. Although shorter in distance, the outgoing leg against the tide meant that the time taken was similar to that expected for the original route. Nonetheless the kayak was still described by many as ‘epic’, ‘grueling’ and ‘challenging’. The run went from the transition at Dolgarrog Bridge to the Nant Conwy Rugby Club, via Cowlyd Dam and the Crafnant Valley. The athletes had to contend with driving rain and forecasted winds of 55mph at 500m, as well as some very muddy descents. Thankfully everyone got round with nothing worse than cramping muscles, sorted out by Jane, the onsite physio. The bike leg was out and back from the rugby club, and incorporated parts of the Marin Trail in an 18kms loop around the Gwydir Forest. The route was a mixture of forest track and single track, and was testing enough, especially for the solo competitors, many of whom had been out for over 3 hours already. 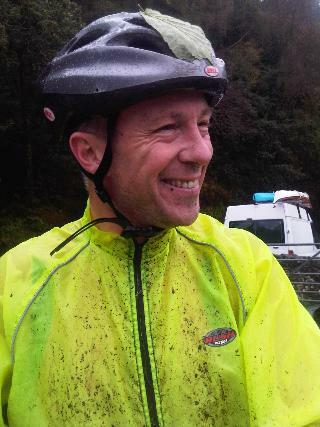 Although more sheltered in the trees, the rain meant running water, mud and slippery rocks to deal with, resulting in numerous punctures and one buckled wheel. The eventual winner was Monmouth Tri’s Ian Smith, in a time of 3:22:16. The winning team, going by the glorious name of Captain Underpants and the Wilde Wedgies, also finished 4th overall in a time of 3:28:14. It consisted of Steve Jones from Colwyn Bay, Marc Reeves and Amanda Wilde. Despite the weather there were grins all round and lots of requests to put the event on next year. The success was mainle due to the army of volunteer supporters who braved the rain to marshal, provide radio links and first aid. The organisers would again like to thank everyone who helped, many of whom were Eryri members, as well as the sponsors and supporters who provided everything from prizes to beer for the marshals. We were also very grateful for the loan of Eryri kit and the event clock. The main objectives of the event were to encourage local athletes to compete, but also to raise funds for the Snowdonia Society to help in its aims to conserve and promote Snowdonia.